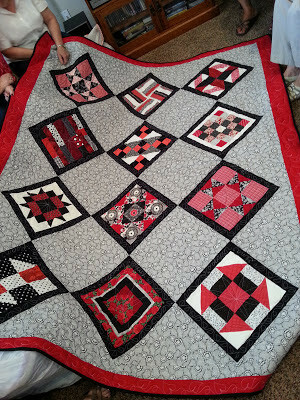 After showing you my Friendship Quilt I thought I'd show you the quilts made by some of my club ladies. Not everyone has gotten theirs finished yet, but here's the ones that have popped up so far. Of course, I like mine the best...But isn't that the way it should be?! It has been fun to see everyone's take on the blocks they received. As you can see, we definitely each have our own unique quilt personalities. This one was made by Kae. She was the first to get blocks and the first to get hers finished. She has a son who was in the military so a patriotic theme seemed quite obvious for her. She loves dark blues. She made each of us her signature "heart" block in our color schemes. 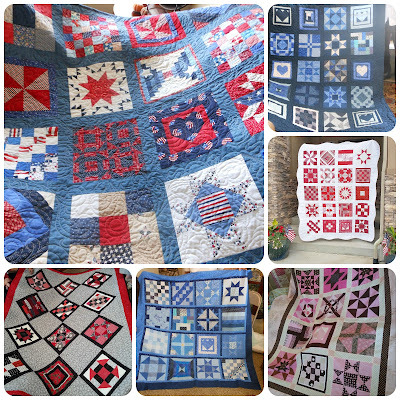 See if you can spot it in each of the quilts. Connie wanted a mix of pinks and browns. She is our newest member as was lucky enough to join in the fun right before the year ended. Nelda also picked blue, but said either light or dark blues. 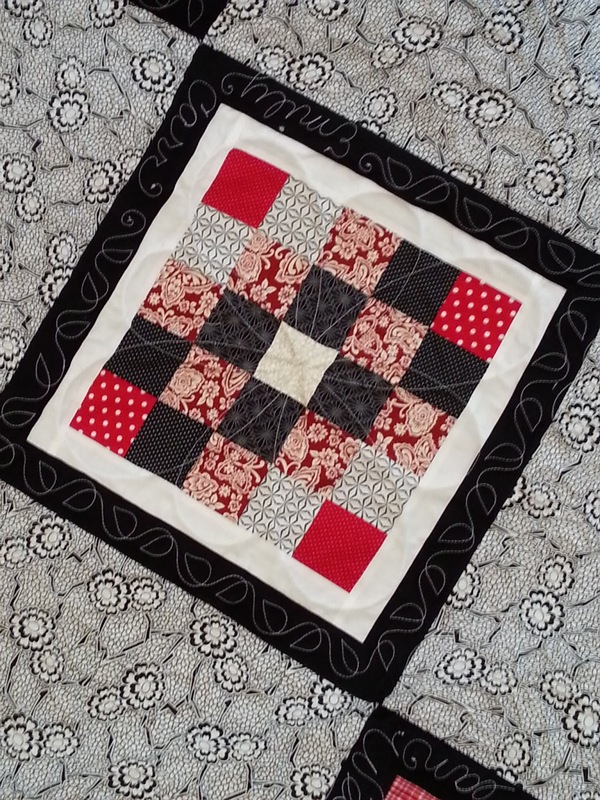 She chose to sash her blocks in a two-tone design which I think looks cool with her blocks. Jolene's black and red blocks are very striking to me. She did a nice job setting them on point. 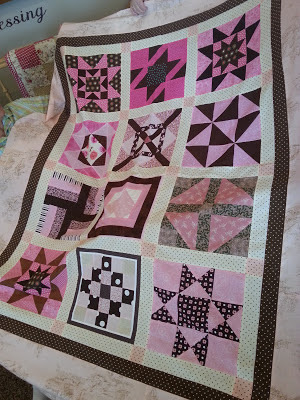 A fun little detail she had was having her quilter add each person's name to the block that they made. We all thought that was pretty cool! 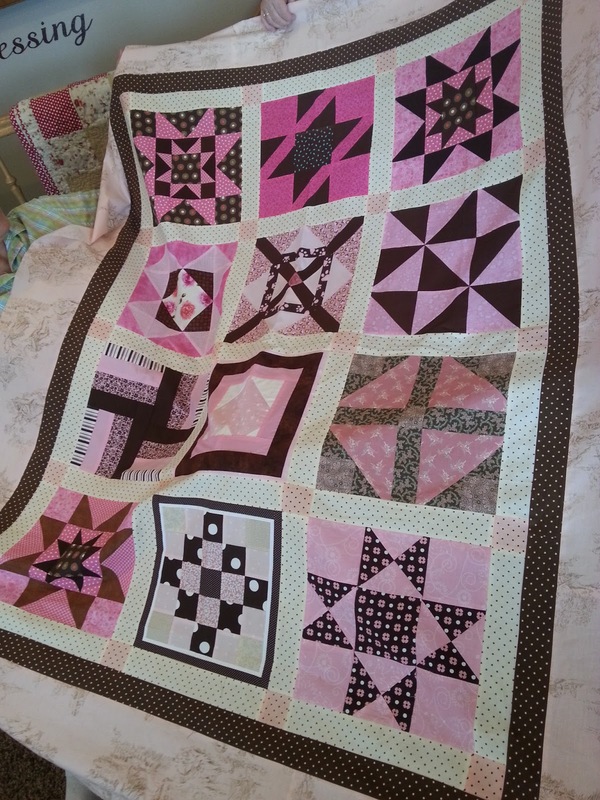 Like I said, each of us definitely has different tastes, but with a each other's help we've been able to create beautiful quilts for ourselves. It's been a fun project for us!